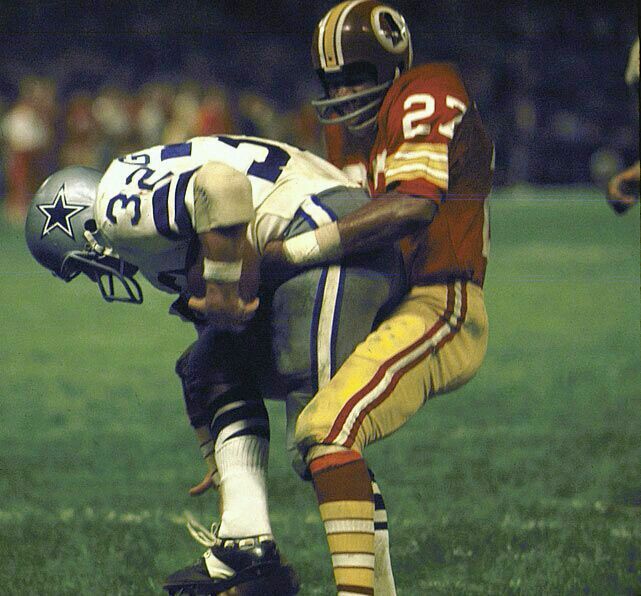 In October of 1973, the Dallas Cowboys and Washington Redskins faced off in D.C. on Monday Night Football. George Allen stood in his third season as Redskins head coach. Cowboys legend Lee Roy Jordan told The Game before the Money that Allen ramped up the Cowboys/Redskins rivalry into the state of fury it became. The Monday Night Football affair came down to the last play – the Cowboys had the ball on the four yard line with four seconds left, needing a touchdown to tie. Washington’s Ken Houston, a future first-ballot Hall of Famer, made one of the signature plays of his career. He stopped Dallas running back Walt Garrison at the goal line as time expired, after Garrison snatched a pass from quarterback Craig Morton. Houston, who had just been obtained from the Houston Oilers for five players, became hugely popular in Washington overnight. Washington’s 14-7 win put them in a first-place tie with the Cowboys. Houston told The Game before the Money that the making the play was a result of positioning and the preparation. He provides details about the play in the Texas Sports Hall of Fame podcast below (at the 14:30 mark). Also hear him tell fantastic stories about his life and career throughout the episode. The podcast is hosted by The Game before the Money author Jackson Michael, and presented by the Hampton Inn — Waco North.